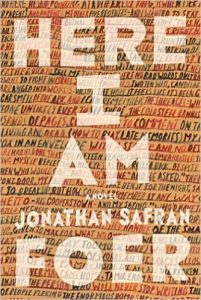 Here I Am is a difficult, circumlocutory, beautiful novel filled with the story of an impossibly bright family trying to understand itself – fatherhood, motherhood, brotherhood – trying simply to be there. Or at least that is what Jacob, the father of three boys, the sometime husband to Julia, the owner of their dog, Argus, is trying to do. 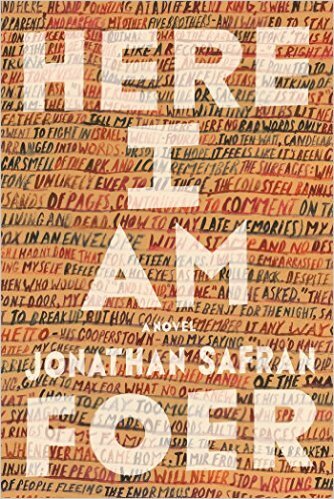 By introducing the novel in this way, I am kind of cheating because Here I Am isn’t only a story of trying to learn how to be there. The words ‘Here I Am’ are what Abraham says both to God and Isaac as reported in the Torah just at the moment he is preparing to sacrifice his son at his God’s behest. And introducing this dichotomy, to be wholly there for both God and son, to be impossibly present for more than one thing or person, also introduces one of the other major themes of the novel: Judaism, being Jewish, what it means to be a Jew. Are American Jews as Jewish as Israeli Jews? Is it possible for Jews to have a homeland? How does a Jew not living in Israel reconcile their Jewishness with this physical distance? And there we have another theme, that of the home. The family home, the religious home, the idea of the endless wanderer so often associated with being Jewish but also with Odysseus, whose story is as present in Here I Am as Abraham’s (the faithful dog, Argus, stays with us till the end). And then there is Other Life, the online world that we are constantly reminded is not a game and in which the younger generation are increasingly becoming more at home in, going into Other Life in order to feel at home. This desire, familiar to most of us, to seek out a home, to be totally there, totally safe, totally accepted, brings Joyce’s Ulysses comes to mind, forcing another layer into the novel, that of confronting and embracing literature with a capital L.
The novel puts all these ideas through their paces, imagines an earthquake in the middle east that forces the instability of the region into new heights of war with far-reaching repercussions that can also then be subsumed once more beneath the weight of ongoing American prosperity. Through all of this, Jacob and Julia’s relationship is being questioned, Jacob’s grandfather dies, their eldest son, Sam, is about to have his bar mitzvah, some of their Israeli cousins are visiting (others are already engaged in warfare), their dog is getting older and increasingly incontinent, everything is changing. The novel moves between times from the narrative of family change – the run up and fall out of the bar mitzvah amidst the Israeli earthquake and war – through memory, to a more distant future long after that change took place. We see the story through multiple perspectives – though Jacob’s is the most consistent, Jacob who wrestles with God and becomes Israel – allowing a pleasant breadth of scope, reminding us what it is to be a teenager, how it feels to be middle-aged with a family and what it means to be old. Sometimes these shifts between people and times can feel confusing but ultimately, for me at least, it was an enlightening confusion (also one possibly aided by reading the novel on an uncorrected kindle proof). You could argue the novel is a little sentimental. The children are definitely some kind of future hope, their minds searing, their perspectives brilliantly acute. Sam’s bar mitzvah speech reminds us that there might be a different choice from the one that Hamlet presents, that it’s not simply a question of to be or not to be, but perhaps to to be and not to be. Though it could be argued that hope for the future isn’t sentimental but simply essential? I don’t know a lot about Judaism. I don’t know about being part of a minority, at least not one that doesn’t have all the advantages. How we face issues of belief in the context of claiming physical territory is an increasingly important question (Other Life perhaps asks this of virtual territory; how the virtual impacts upon the physical). In another sense, Here I Am is also about the idea of writing itself, of making marks, using language to express the self. It seems there are never enough words, or ways of configuring them, to do this. It is what all writers try to do: here I am, this is what I think, this is the world as I see it, see me, read me, acknowledge me. Ultimately, of course, Here I Am is about what it means to be alive; the cleaning up, the hours of television watching, as well as the moments that resonate with a kind of hyper-reality, an intense awareness or feeling. In many ways, Here I Am is a depressing book – reading about the end of a marriage is hard (there are so many ways in which this could be applied to the novel) – and yet I thoroughly enjoyed it. This is a serious novel that deserves to be on all the prize lists. I look forward to talking about it and reading about what others thought of it. Next week I’m reading The Angels Die by Yasmina Khadra.